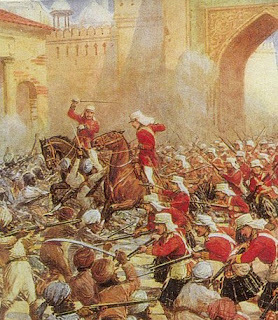 The Government of India announced this week that several programs are being organized to mark the 150th anniversary of the Uprising of 1857 (or, if you prefer, the Sepoy Rebellion, the Indian Mutiny, or India’s First War of Independence). Officials say the programs are part of "a national tribute to the martyrs who lost their lives for the cause of independence of our country from the clutches of the British raj." In its 2007 budget, the Government of India set aside an amount of Rs. 10 crore for the celebration (about $2.3 million or £1.2 million if I've figured the conversion correctly). Among the plans: a national youth rally in May in which 30,000 young people will walk from Meerut to Delhi, covering a distance of 80 kilometers in five days, in a modern version of the sepoys' march between those two cities. 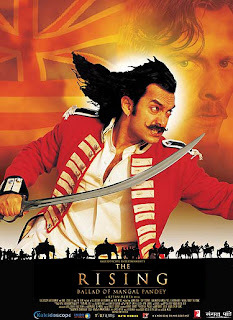 For those who would like to mark the occasion with a bit of Bollywood, I recommend The Rising: Ballad of Mangal Pandey, starring the very handsome Aamir Khan as Pandey, a sepoy in the 34th Regiment of the Bengal Native Infantry of the British East India Company in Barrackpur. Pandey goes berserk (perhaps under the influence of bhang) on hearing rumors that a new bullet cartridge is greased with pig and cow fat. He attacks his British sergeant, setting off the chain of events that leads to the wider rebellion. This film broke Indian box office records when it was released in 2005. Its historical inaccuracies (huh...go figure) caused rioting in Uttar Pradesh, Pandey's home region. Read the review in the blog "chapati mystery" here. Related link: The Financial Express, 8 April 2007: "Accidental hero or a forgotten martyr? The controversy surrounding his intentions apart, Indian history has failed to give sepoy Mangal Pandey due credit"